Who Is Vital Reds For? Losing weight is not an easy task. Some people go to great lengths of doing cardio exercises several hours a day and eating the right diet. But sometimes, these techniques do not yield fast results. Thus came the rise of assisting diet and exercise with weight loss supplements. Dr. Steve Gundry MD is a successful researcher and surgeon. He released a book about weight loss: Diet Evolution, on 2008. This book gained fame to health conscious folks and dieters, so Dr. Gundry came up with a weight loss formula to offer further help: Vital Reds. Despite weight loss being the target function of Vital Reds, it also claims to achieve skin benefits as a bonus. The polyphenol ingredients in it aid in skin problems like wrinkles, fine lines, and sagging spots. Besides the anti-aging properties, Vital Reds’ components help in regulating the cholesterol system. In turn, this is beneficial for heart health and the circulatory system. So, who can take in Vital Reds? If you have issues in your metabolism, then Vital Reds could be your friend. The health-friendly ingredients in it could assist in overall digestion. Water retention causes bloating and increased weight. By dealing with bloating, this supplement could help an individual look better physically. Vital Reds also targets people who want to take good care of their skin. Who doesn’t like to appear their best in their later age, right? Besides the previous ones mentioned, this supplement also claims as an energy-boosting one. So if you are looking to carry out your everyday plans with more energy, then you can check this one out. You might be wondering how Vital Reds could able to squeeze all those benefits in it? To begin with, Vital Reds is a ‘concentrated polyphenol blend’ powder supplement. One should add the formula onto a glass of water or any choice of beverage. Drinking it once daily is enough, as it claims to be. The product should also dissolve quickly. The formula of Vital Reds is easily digestible so you can choose if you like to drink it with our without meal. For other preferences, they also have it available in “Red Berry” flavor. How Vital Reds works is all about the 21 superfruits rich in polyphenol that comprise it. These polyphenols, which most people know as antioxidants, reverse damage that is caused by oxidative stress. Besides better skin appearance, the primary claim of this product is weight loss, through the aid of these superfruits, which boost the metabolism. You might wonder what these superfruits that constitute Vital Reds? 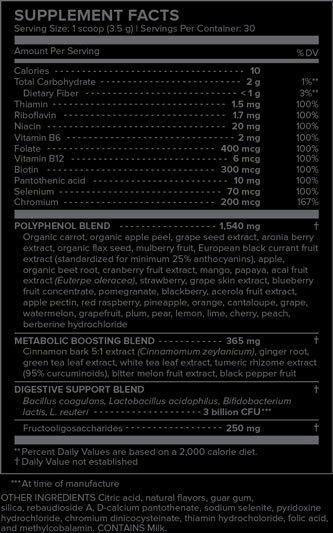 The 1540mg (daily value not established) daily Polyphenol blend of Vital Reds include these great fruits and vegetables: organic carrot, grape seed extract, aronia berry extract, organic apple peel, mulberry fruit, and European black currant fruit extract (25% anthocyanins). It also has organic flax seed, apple, organic beet root, mango, papaya acai fruit extract, cranberry fruit extract, strawberry, grape skin extract, pomegranate, blackberry, and acerola fruit extract. Moreover, it contains blueberry fruit concentrate, apple pectin, red raspberry, pineapple, orange, grape, watermelon, cantaloupes, grapefruit, plum, lemon, lime, cherry, pear, peach, and berberine hydrochloride. The 365mg of a metabolic boosting blend consists of cinnamon bark 5:1 extract, ginger root, white tea leaf extract, green tea leaf extract, turmeric rhizome extract (95% curcuminoids), black pepper fruit, and bitter melon fruit extract. It also includes 3 Billion CFUs of a digestive support blend, which contains Bacillus coagulans, Bifidobacterium lactis, L. reuteri, and Lactobacillus acidophilus. To note, Vital Reds is free of artificial sweeteners, sugar, soy, and lectin. Gundy MD’s Vital Reds claims it is made of 100% safe and natural ingredients. The product has been carefully tested for potency and safety at a third-party facility. As of now, there are no reported drastic side-effects. Though some users report being allergic to some of its ingredients so it should be taken with precaution. Moreover, it is still wise to check with your health care provider before purchasing any product. If you plan to get Vital Reds, you can purchase it from Dr. Gundry’s website here. First of all, Gundry MD offers a zero questions asked, 90-day money back guarantee. There are no other stores that offer the same. Even if the bottle is empty, you can still get a refund. It is also important to note that purchasing Vital Reds from Gundry MD lets portion of your proceeds to go to Charity Water. This charity donates clean water to developing countries. The past few years, I have seen a lot of companies creating green juices. There is nothing wrong with it, but some might find it too funky. Despite the look, those green drinks are really loaded with nutrients for the body. But, what about something red? I think Dr. Steve Gundry of Gundry MD heard my question when he formulated Vital Reds. Besides the color, he created an all-rounder dietary supplement in an all-natural manner. The potent and quality ingredients in it include: thiamin, riboflavin, niacin, vitamins B6 and B12, folate, biotin, chromium, panthotenic acid, and selenium. 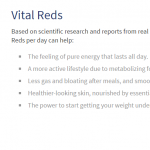 Vital Reds claims to be a weight management supplement. Following exercise routines and strict diet plans can be helpful but it does not provide a great result unless your metabolism is fired up. Vital Reds harnesses power from several superfruits to aid with weight issues, in a natural way though metabolism improvement. Another great feature and probably the most needed by people is its energy-boosting capabilities. Some people get real shaky with caffeine; not everyone can deal well with it. The organic fruits and vegetables in Vital Reds claim to tackle this issue. It asserts that the ingredients in this product could maximize one’s energy without the caffeine. One other asset of Vital Reds is its skin-caring properties. This might be my favorite one since I am a big fan of antioxidants. The polyphenol blend of Vital Reds combat free radicals the bloodstream, which could help you reduce your risk in diseases. The end result and bonus point is the clearing of the skin. On another note, I love eating yogurts. Probiotics are such beneficial bacteria, which could aid for your digestive system to run smoothly. Vital Reds’ digestive support blend helps with that. Despite the seemingly lovely benefits of Vital Reds, there were still some not-that-good aspects. Other users who have tried it say that they do not like the taste and texture. We know taste is important for this kind of products, since this is one a person takes on a regular basis. Others also complain that the cost of Vital Reds should just be even a third of its actual price. For most people, too much fruits would likely lead to weight gain. 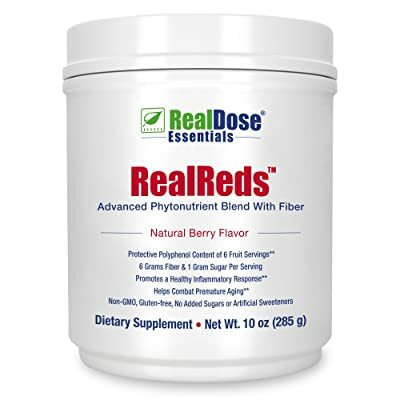 RealDose Nutrition’s RealReds is a supplement that claims it can provide the benefits of several fruits even without the sugar. RealReds contains eight super-fruits, along with organic vegetables and digestive enzymes. RealDose Nutrition believes that weight gain and inflammation are connected in a cycle. They formulated the RealReds so it could break that cycle, prevent inflammation, and in turn, make it easier for one to lose weight. If you’re looking for an antioxidant and weight loss supplement in one, as well as liking to have a fruity taste in it, then you might try this one. 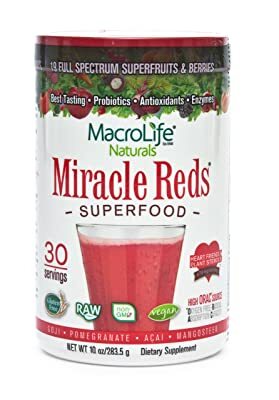 A science-based rainbow comprising of 19 superfruits, plant sterols, probiotics, and herb extracts, MacroLife’s Miracle Reds claims that it can reduce one’s risk of heart disease. Each serving consists of five servings of power fruits, which contain antioxidants. Miracle Reds also contains enzymes and hydrating phytonutrients, which asserts to reduce muscle soreness. This is especially useful for active people who are looking for a post-recovery formula. Just looking at the name and one might think initially that this is a super drink. 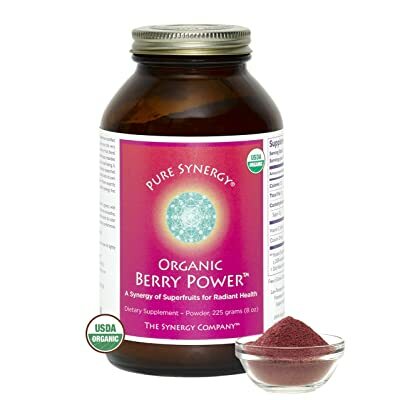 Similar to the Vital Reds, Pure Synergy Organic Berry Power combines the ‘power’ of 20+ organic berries. It is rich in antioxidants and claims to have abundant source of polyphenols. It targets healthy support for one’s eyes, skin, heart, and immune system. For health conscious folks, it’s important to note that this product is certified organic and free of any sweeteners, additives, and gluten. Pure Synergy Organic Berry Power might be great for people who are looking for a healthy drink that is packed with antioxidants, without any harsh chemicals added. Vital Reds by Gundry MD focuses on a natural formula for weight management. One’s preferred results can be achieved through this holistic approach by dealing with the primary causes of weight gain: poor digestion and slow metabolism. Besides this main reason, the product also claims it can help in improving a person’s skin appearance (due to antioxidants included in it), as well as boosting one’s energy without caffeine. If the taste does not work for you, you may try RealDose Nutrition RealReds. Besides that it has similar properties with Vital Reds, customers noted that this product tastes sweet. Most people might consider taste in their drinks as an important factor. But if you prefer a multipurpose supplement with polyphenols, metabolic-boosting, and digestive support blends, then Vital Reds might be suitable for you.